Before starting, make absolutely sure you have followed all the instructions off the Initial Commissioning guide. Start your Sintratec Central application and connect your printer via the provided USB cable. The printer is automatically detected and connected. If you don’t already have the application, follow the steps in the Getting the Software in the Software section. In Sintratec Central, navigate to 3. Powder. By clicking on the up and down arrows you can move the powder platforms of your printer in a desired position. Use the single arrow for small steps and the double arrow for bigger steps. The right powder platform is the Reservoir and holds the fresh powder. The left powder platform is the Print platform and will be printed on. For your first print you will need about 3 cm of powder. Move the print platform to the top, while the reservoir platform should be about 3 cm below the very top position. For your later prints move the right platform to the bottom and the left to the top. Evenly pour the Sintratec Powder onto the Reservoir platform. When full, also pour some on the Print platform. Make sure the surface is as level as possible before moving on. To make the surface perfectly flat and ready for printing, use the Apply Powder button. The powder coater will smoothen the powder surface and drag excess powder into the overflow bin (left). Repeat the apply powder move until you have a perfect surface without holes. If you keep having large dents in your surface, pour some more powder. The Sintratec Central supports STL files. Every common CAD application has a STL export function. You can also find STL files for almost everything on the internet. Make sure your STL files are repaired if necessary. Read more about the STL format and find sources on this separate page. Before starting, make sure you have followed all the instructions in the Initial Commissioning guide and filled up your machine with sufficient powder. Start your Sintratec Central Application and connect your Sintratec printer via the provided USB cable. Navigate to 4. Print and locate the Calibrate Button. Once the calibration window opened, click Load Calibration Print. For your first print, the 3D model was automatically loaded into 1. Place. 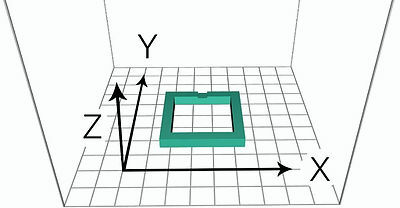 The model is a calibration shape which will allow you to inspect the results of your first print closer. For this print, we recommend you don’t move or tilt the model. Drag and drop your STL files into the Sintratec Central and place them. Please read the section Tab 1. Place and especially the “Best Position Practice” carefully. The quality of your print depends on the positioning of the 3D files in the Sintratec Central. Navigate to Preview. You will see one layer at a time of your print. By dragging the slider you can navigate through all the layers. Each layer contains multiple laser path lines which will later be burned onto the powder surface. We recommend you always check the Preview! If your file was faulty there might also be misplaced laser path lines. If you detect this before the print fails, you can save time and money. Before starting to print, make sure you have followed all the instructions in the Placing Your First Print guide and filled up your machine with sufficient powder. Navigate to 4. Print and click the Start Print button and turn the Laser Safety Key into the armed position. Sintratec Central will start uploading the print file to your machine, this will take a few seconds. Beyond this point the process is automatic and does not need any user interaction. Do not forget to turn the Laser Safety Keyinto the armed position! First the printer will need to reach printing temperature. This will take several minutes to hours. The Central displays the remaining warmup time. If you are an experienced user and you know that the machine is sufficiently hot, you may skip this step. If you skip without reaching the required temperature, the print quality will be negatively affected! The machine now lays down several hot powder layers. The hot powder layers will be the bed on which the print is built. A good and warm powder bed increases the print quality. If you are an experienced user and you know that the powder is sufficiently hot, you may skip this step.If you skip, the print quality may be negatively affected! In this process the laser selectively melts the powder layer by layer and thus creates your first printed 3D model. The powder surrounding your model does not melt and can be mostly reused. To complete the print process, the printed object is covered with powder to ensure even cooling of the part. Then the machine slowly lowers the temperature until it is safe to unload it. When the printer leaves the cool down mode and becomes idle, the print is done. After the print, do not forget to turn the Laser Safety Key into the disarmed position! Before unloading the printer, make sure the machine has left the cool down mode and is idle and the Laser Safety Key is in the disarmed position. Wear gloves and a dust filter mask. If the machine is still hot, be sure to let it cool down and not to touch any hot surfaces. When working with powder, always wear protective gloves and a dust filter mask! To empty your machines print chamber, use a scoop to transfer the powder from the printer to a clean bowl. Suitable powder vacuums improve the speed of the procedure and are recommended if you print frequently. Using a steel wire brush, separate the print from surrounding powder. The more powder you remove the more powder you can recycle and use for later prints. Used powder may contain small amounts of waste powder. Waste occurs when powder particles bake and stick together. These have to be removed by using a sieve. We recommend a mesh 100 sieve (150um). Refreshed Powder must be mixed thoroughly to achieve a homogenous powder distribution before refilling your Sintratec printer. To fine tune your printing results we have provided a digital scaling method. First you will need to accurately measure the calibration print you have just printed and compare it to the target size. To calculate and store your new calibration values, navigate to 4. Print and click on the Calibrate Button. 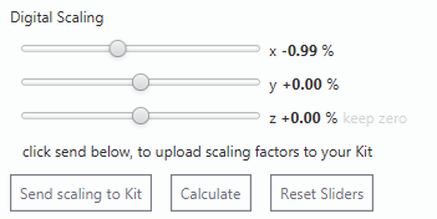 To get to the Scaling Calculator click on Calculate. 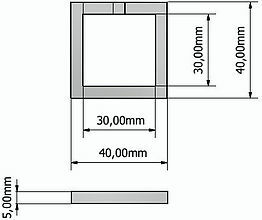 In the example above the measured part size in x-direction is 40.4mm when it should have been 40mm. If the other dimensions also vary, fill the values in, otherwise leave them at initial value 1. 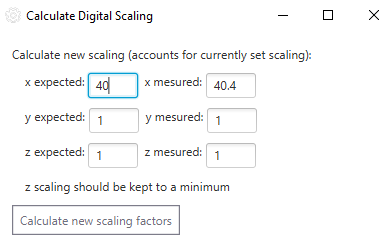 Confirm by clicking Calculate new scaling factors. The new values are automatically calculated by also taking the previous scaling values into account. To accept click on the Send scaling to Kit/S1 button and the values will be stored on your machine. Once you have found the perfect digital scaling for your Sintratec printer, it is good practice to write it down as a backup. Even though the machine stores the values, in unforeseen cases they might get lost. Every now and then you should maintain your printer to keep the printing quality high and extend the life span of your Sintratec printer.